Ney’s parents fled Cambodia, when the Khmer Rouge killed millions of people under Pol Pot’s regime. 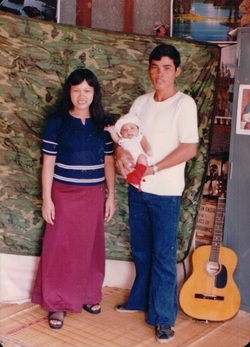 They escaped Cambodia when they were just teenagers, in the 1970s. They swam through leech-filled swamps, crossed over many mountain passes, avoided guerilla soldiers and wild animals, and watched their step to avoid active landmines. They did all of this barefoot because they couldn’t afford shoes. Later in the year, Ney’s parents and sister made their way to the United States with a quarter ($0.25) between the three of them. Their dream was to own a restaurant and ended up owning four of them. After Ney finished reading Barker’s book, “Mister B. Gone”, Ney decided to write an e-mail to the webmasters of his website. His assistant wrote him back and was asked to send a résumé and set some days aside, for the interview for the apprenticeship. His friend, Travis H., gave him an uncirculated Colorado quarter. He placed it in his wallet and he headed out west, with his family. The time was 4:30 p.m. and the date was Friday, June 13, 2008. He was interviewed by Barker and after three questions, he was hired. His catch: to write back weekly. TheRequiem:Sareth is a gentleman,and much loved in my household.I hold him in the highest regard. P.U.L.P., a publication in Pueblo, Colorado, had their first annual 24-hour film festival. Filmmakers had 24-hours to create a ten minute film. Ney got together with friends: Erica E., JohnMark W., Felicia T., and "Goon Rat". They didn’t have time to edit their film, "The Narcoleptics", and decided to record over scenes they didn’t need. The first time the audience watched it was the first time they viewed it. The budget for the film was $25 and $15 went to fuel. 2% was scripted, 98% was improvised, and won the award for “Best Film to Watch While Stoned”. This publication is dedicated to artists who busked on the street, raised a quarter and put it towards their dream.